That’s a photo of our home (right) beneath the sea, with me riding seahorse merry-go-round. There’s even an amusement park down there. That’s me fluttering by in my pretty, fluttery, pink mermaid outfit. 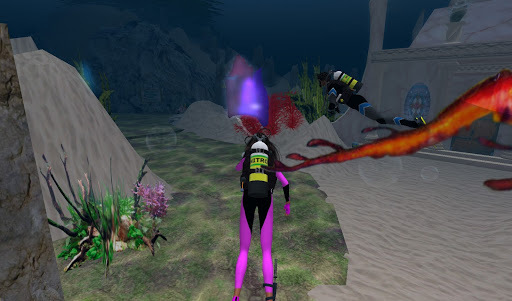 The undersea world of the Summits is really meant more for mermaids and mermen, and we did slide into our mer-gear and enjoyed the super speeds you can get while underwater. But after fluttering around for awhile, we suited up for some serious scuba adventure and there is much to see from the Summits all the way across sims to the Pillars of Hercules. That’s me (center) and Tak (back right) suited up and beginning our exploration of the vast undersea world. This giant octopus was not partiuclarly violent but he sure kept is eye on us, well, more like he had his eye on me. We swam across three of the sims in the Pillars group and there was a great deal to see and enjoy. There were undsea lava domes, and along the way ventured into one of the long caves, even tho we aren’t trained for cave diving. /me bows head in disgrace. Ultimately, we made our way to a beach on the Pillars sim. My guess is we’ll be doing some more scuba and also time as mer-peeps too. This entry was posted in Exploring and tagged Adventure, Exploring, Photography, Second Life. Bookmark the permalink.